The death of the multichannel cable bundle will take years to play out, but investors were reminded of its inevitability by the signs of erosion from even the best regarded media players. TV viewing is in decline. Pay TV subscriptions are falling. TV ad sales are down. Meanwhile, viewership is booming for NFLX and GOOG’s YouTube, as Americans are expressing a strong and growing preference for streaming on-demand video. The TV nets are coming late to the game, licensing linear streams to OTT players, like DISH, SONY and likely AAPL, offering skinny bundles online. We believe that the OTT bundles are unlikely to stem the tide toward on-demand streaming, damaging traditional media brands, and leaving them at a growing scale and data disadvantage in competing for creative content. Rising programming costs, particularly for live sports, will squeeze networks simultaneously suffering from top-line erosion. NFLX is the clear winner in subscription on-demand streaming, likely to continue its explosive sub growth with significant future monetization options. AMZN is best positioned to be number 2, ahead of TWX and its overpriced HBO Go. 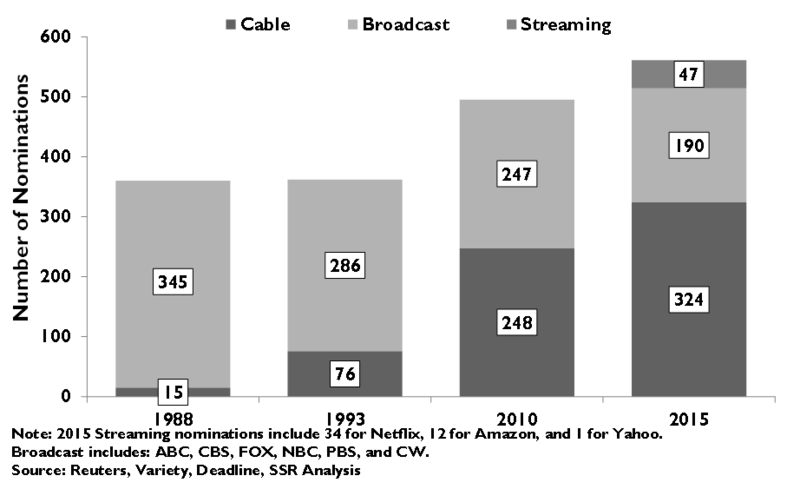 YouTube dominates the similarly fast growing ad driven, short-form video paradigm that it pioneered. We do not see FB as a threat to YouTube’s primary use cases, although its newsfeed has proven a robust channel for auto-play video ads. Viewers are shifting to streaming video. Primetime broadcast ratings have dropped 41% since 2005. 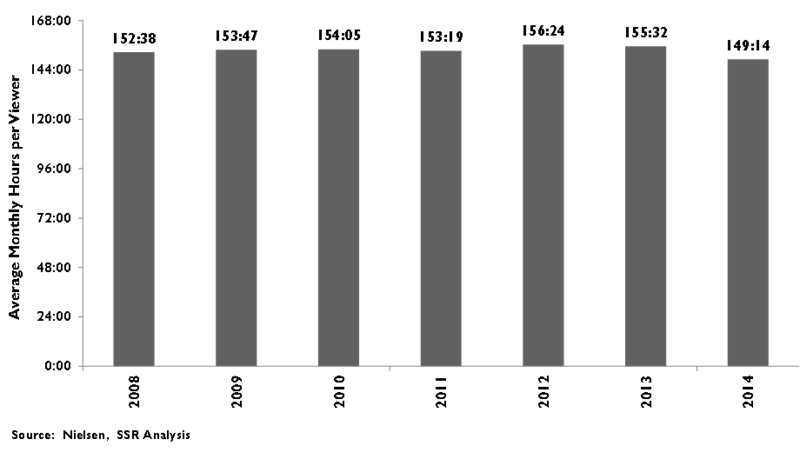 Overall TV viewing began to decline in 2014, according to Nielsen, whose methodology we believe systematically overstates audiences. 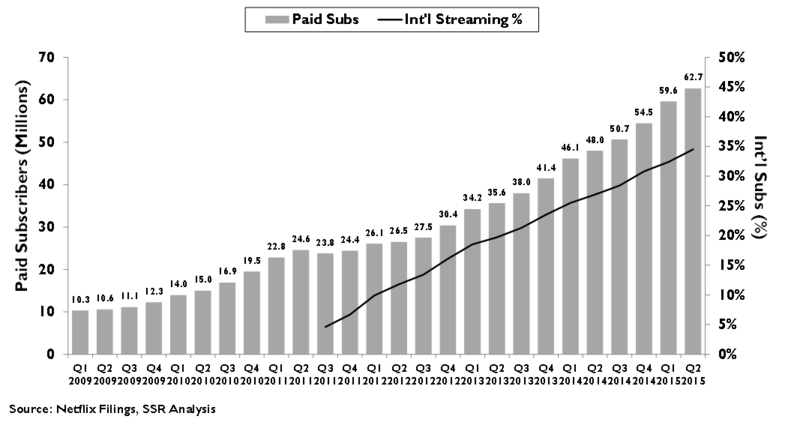 Total US pay TV subscriptions dropped in 2013 and accelerated in 2014. Meanwhile, we estimate NFLX streaming hours are up ~30% YoY to about 15 hrs/week for each of its 43M US subscriber households. Similarly, YouTube streaming hours are up 50% YoY – ~1.8B hours/mo or over 2 hours per week for each of the 155M unique monthly US visitors. TV networks look to recreate cable bundles on line. After years of protecting the cable bundle, networks have begun selling live streams to on-line bundlers. 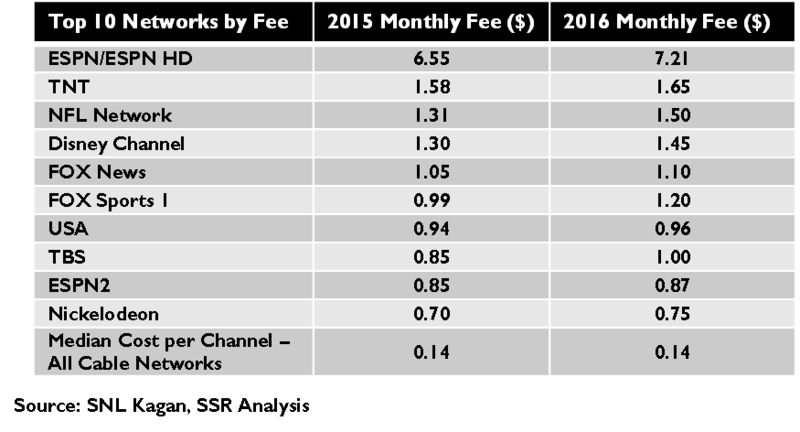 DISH launched Sling TV in Feb with 16 channels, including ESPN, for $20/mo. A month after, SONY launched VUE for PlayStation owners, offering 50 channels for $50/mo., with CBS, NBC and FOX but no ABC or ESPN. AAPL is reportedly negotiating for its own bundled OTT service, which would include local broadcast channels. Short window for bundled OTT. Live network bundles will compete with on-demand services, like NFLX and YouTube, for viewership. Beyond sports and other live programming, this is becoming a losing proposition. A recent study suggests that time shifted viewing – DVR, VOD, and streaming – has surpassed live viewing for a majority of Americans, with the preference even clearer for coveted younger demographics. The implied trajectory toward time shifting is steep, a very poor indicator for DVR-less OTT bundles. The increasingly attractive libraries of on demand programming available on NFLX, YouTube, and AMZN will make expensive OTT bundles less viable with time. Talent is king. Broadcast networks typically buy 8-12 new series each year to replace the weakest 30-40% of their schedules. Major sports contracts expire after 5-10 years and must be renegotiated. With cable nets and now, streaming platforms, competing for the most attractive content, the cost has continued to rise, squeezing margins for all. A vicious cycle could eat at bundled TV as subscription and ad dollars follow viewership to streaming platforms, enabling the streamers to compete even more aggressively for content. Disney CEO Iger recently acknowledged the dynamic and the inevitability that its ESPN franchise would eventually become a direct to consumer service. NFLX has an insurmountable lead. NFLX has a growing base of 42M US subs, collectively watching 3.4B+ person hours/month – on par with the suspect Nielsen estimates for the broadcast nets – growing some 40% YoY. Leveraging this scale, NFLX is funding 36 original series for 2016, far outstripping rival HBO, which is second at 21. Moreover, NFLX’s unique and detailed data on viewer preferences give it a significant edge in the buying process. Rival services, like AMZN and HBO Go, will joust for second place, as the TV networks dither over entering with their own branded online services, reviving the jointly owned and badly malnourished Hulu, or supplying their content to others. YouTube dominates the alternative video paradigm that it pioneered. YouTube gave new talent and independent producers a platform to bring video direct to consumers, with few constraints on the form, quality or content of the programming and a 55% share of ad revenues. This has been wildly successful. YouTube has more than 2.5M regular contributors – more than 1,250 with >1M subs. YouTube viewing is up more than 60% YoY to ~10B hours/month. Half of this is mobile, which has doubled YoY. 8 of the 10 most popular celebrities with US teens are YouTube stars. 72% of US millennials regularly watch YouTube, vs. just 53% that watch cable TV. FB starts from far back. FB and its 1.5B global MAUs is the obvious rival to YouTube for video ads, but its nascent business is way behind as a platform for popular content. While FB may someday break out a standalone video app, today its videos are embedded in user newsfeeds making it difficult for users to find relevant videos and for creators to effectively market to their audience. FB is reporting strong growth in views, but quality of those views relative to YouTube is suspect. Still, the opportunity is more than big enough for FB to build a successful video business without really challenging YouTube’s leadership. We note that ad hoc live streaming, pioneered by TWTR’s Periscope and the startup Meerkat, is an intriguing extension to the YouTube paradigm. Few TV brands will make it. As the paradigm shift to on demand streaming for recorded video content plays out, TV networks face a dilemma: defend the status quo and slowly lose relevance or compete and cannibalize themselves. At this point, even aggressive strategies risk being too little, too late. Meanwhile, NFLX seems a juggernaut, with future monetization options in live content, pay-per-view, or new service tiers, including ad support. TWX’s HBO Go is intriguing with its “must see” originals, but the late start, high price point and narrow library leave it unlikely to challenge NFLX for leadership. AMZN is driving sub growth by bundling video with its other Prime benefits, but won’t match NFLX or HBO on the breadth of its originals or the depth of its library. Hulu is hamstrung by its owners’ unwillingness to commit. GOOG’s YouTube asset is underappreciated by investors, and should drive significant revenue growth going forward. FB will gain from placing video ads in its newsfeeds, but is not well positioned to compete with YouTube for on-demand ad supported streaming. One by one, media company CEOs have put a brave face on the state of the cable bundle despite the ample evidence of its deterioration. The shrinking number of pay TV subscriptions? “A slow leak that is unlikely to accelerate.” Falling ratings? “Nielson is not counting all of the viewers watching on a time shifted basis.” Weak upfront ad sales? “Ad buyers are simply choosing to hold back their decisions until much closer to the air date.” Ad revenues down year over year? “To be expected after the mid-term election spending in 2014.” Pay no attention to the man behind the curtain – the cable bundle is wise, powerful and eternal! Or not. Media investors have awoken from a five year coma to discover that cord cutting is real after all. DIS CEO Bob Iger’s admission that even mighty ESPN was facing falling subscriber counts and soft ad sales shook them into a panic. The next day – a Black Tuesday for US media stocks – DIS, CBS, FOX, TWX, CMCSA, VIA, DISCA, and SNI dropped an average of 8.2%. After Wednesday, these 8 companies had shed a collective $46.2B in market cap. Ouch. Separating out CMCSA and its massive cable system business, the remaining 7 media giants trade at a collective cap weighted P/E of 17.9, still suggesting better than market cash flow growth and ahead of their long term average. Consensus analyst expectations still suggest 4.7% sales growth over the next 5 years, perhaps due for some significant revisions. Meanwhile, nearly a month prior NFLX CEO Reed Hastings laid out the picture from the opposite angle. Subscriptions were up 17% to 42M in the US, with domestic viewing hours up 40%. Assuming 1.5 viewers per stream, Netflix’s average audience is now bigger than any US network, cable or broadcast, and growing. Around the same time, Susan Wojcicki, head of GOOG’s YouTube business, shared some similarly impressive numbers. YouTube monthly viewership is up 40% YoY, and the total watch time is up 60%, the fastest growth in more than 2 years, to more than 10B hours per month. Mobile, which now accounts for more than half of those viewing, had a 100% jump in ad revenues YoY. The TV industry’s response has been cautious, licensing live feeds to DISH, SONY and, likely, AAPL for skinny bundle OTT services, but refusing to allow cloud-based DVR functionality. Trends suggest that online linear TV may prove less than popular. Hub Entertainment Research recently reported that 53% of all US video viewing is time-shifted – DVR, on-demand, or streaming – with millennials even less likely to watch linear TV. TWX and CBS have jumped in with on-demand streaming versions of their premium channels, but at price points too high to encourage cord cutting. We believe network TV is at the beginning of a long squeeze between weakening fees and ad sales on one side and rising content costs on the other. Streaming rivals will have increasingly larger scale, better data, and deeper pockets to buy more of the best content, including the life blood of linear TV – live sports. We acknowledge that the exodus that has begun will take many years to complete, but it is, nonetheless, inevitable. Media players that are diversified away from the cable bundle, e.g. DIS, or already moving to solidify their bona fides as streamers, e.g. TWX, may fare better than others, but all will suffer. 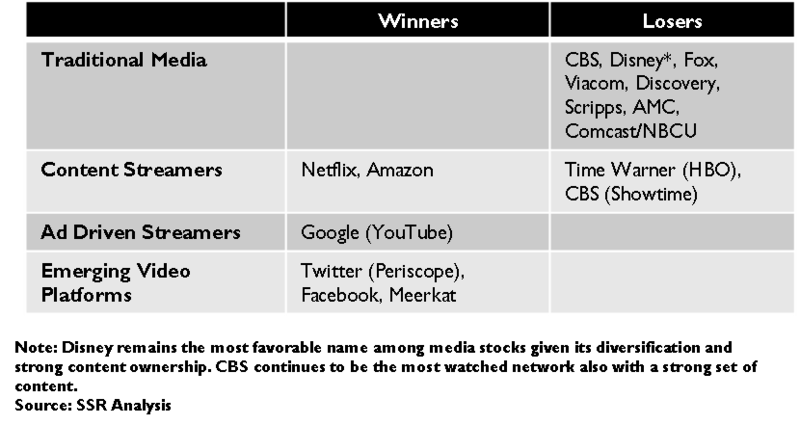 Meanwhile, NFLX and GOOG should continue to reap the rewards of their dominance for online video. AMZN and FB have intriguing opportunities in what should be a huge market, but neither is likely to challenge for leadership. We also note that ad hoc live streaming, pioneered by TWTR’s Periscope and the startup Meerkat, is an intriguing extension to the YouTube paradigm and could be the “next big thing” in video. Broadcast television ratings and viewership have been in decline for well over a decade, ravaged first by the rise of cable networks and more recently, by online streaming video. Last year, Nielsen finally called out a YoY decline in aggregate TV viewership including the cable networks, an inflection point that we believe had passed a few years earlier and obscured by Nielsen’s network friendly methodology (Exhibit 1). Adding to the pain, a rapidly growing percentage of those viewers still watching TV are doing so on a “time shifted” basis via a DVR, on-demand, or online streaming, significantly reducing the quality of the audience for advertisers. A recent study, by media research firm HUB Entertainment Research, found that just 47% of US TV viewing was of real time network feeds, with the majority of time spent watching “time-shifted” programming. The shift is even more pronounced for the advertiser coveted millennial demographic (16-34 yo), which watches 61% of its total TV time watching recorded content rather than scheduled programming. Almost half of the “time shifted” hours, or about 25% of total viewing, were spent with online streaming services, like Netflix, Amazon and Hulu (Exhibit 2). Nielsen, whose suspect methodology we will examine shortly, doesn’t bother to include these online services in their flagship Total Audience Reports, the latest of which claims that just 10% of the viewing in 1Q15 had been time-shifted. For its widely circulated TV ratings, Nielsen adds the first three days time-shifted (DVR and multi-channel system video on demand) viewings to its live audience estimates, a metric called C3. For Primetime broadcast network shows, these C3 ratings are down 41% vs. the live-only ratings of the prior decade (Exhibit 3). Because of this slide, the average cost of a 30 second slot in primetime is down 12% since 2009, despite steady increases in CPM pricing. The networks have been aggressive in promoting an extension to C7 ratings, but it is not clear that adding an additional 4 days would add much in terms of total viewership. Nielsen estimates that extending to C7 would add about 3% to total Primetime ratings, with a few popular dramas seeing a more significant 10% boost (Exhibit 4). While streaming companies like Netflix have access to precise viewing metrics, e.g. how many accounts viewed a show, on what device, paused/resumed viewing, at what time, etc, Nielsen’s television ratings continue to depend on an antiquated system of statistical measurement. The rating methodology relies on devices called “peoplemeters” that connect to each TV set in a population of roughly 50,000 US households, selected for ethnic and geographic diversity corresponding to roughly 0.04% of the population. Each “peoplemeter” comes with a remote that controls the choice of channels on its TV and has a separate button for each member of that household to log in as they begin and end watching that TV. 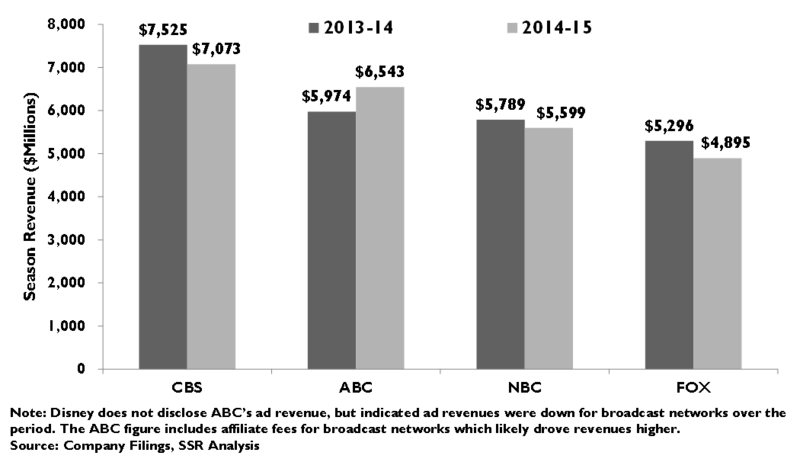 Sample households are recruited with an offer of quarterly payments (~$50-100) and Nielsen supports the household with regular visits to assure that the system is operating as intended. Some participants have reported developing friendly relationships with their Nielsen representatives, who often bring food or other token gifts during their visits. The peoplemeters collect the reported viewing from the household TVs and then upload them each night to Nielsen’s data center, where the data is tabulated and the overnight ratings calculated. This ratings methodology, which has been in place for over 28 years, has several flaws. The first is sample bias. Specifically, the 50,000 families recruited to have the intrusive peoplemeters installed in their homes, may not be truly representative of the 116M TV households in the US (Exhibit 5). Nielsen keeps the identities of these families and the exact demographics of its sample a proprietary secret, but public filings related to a lawsuit filed by Fox a few years ago claiming that Nielsen’s sample was biased against minority families, it was revealed that the sample actually modestly overweights both African-American and Latino families relative to the overall population. More transient viewers, such as college students and other short term renters are not recruited, and viewers that watch in a group setting, such as a bar or a common room are not counted at all. 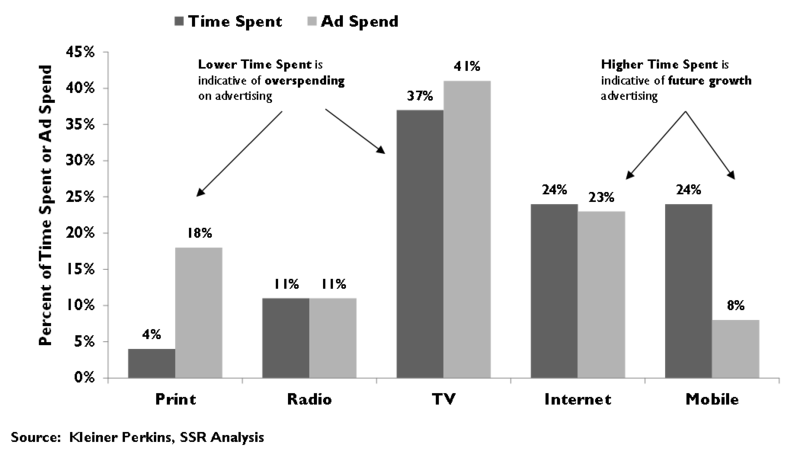 Given that each sample household must agree to a somewhat intrusive process of logging in via the specialized remote, a further bias may be toward families that have unusually strong desires to influence the ratings process, either because of their unusual tastes or higher than usual consumption of TV. Given that families, once recruited, tend to remain participants for multiple years, any underlying sample bias is perpetuated. The second form of bias comes from compliance. While families are asked to log in each person that is watching the TV at the moment, and to log out each person as they stop watching, particularly if other family members continue to watch, it is difficult to believe that these rules are followed religiously. Thus, a child who begins watching the TV at 8PM and leaves to go to bed at 9PM while her parents continue to watch may remain logged in until 11PM when the TV is turned off. More insidiously, family members may be logged in while in the room, but engaged in an entirely different activity – perhaps even watching video on a mobile device – or they may actually be logged on to two different TVs within the house at the same time while the kitchen TV blares its programming to an empty room. Further, there is no measure in the methodology to account for ambient viewing, despite recent efforts to capture multiscreen activities such as social networking while watching television. Despite the opacity of Nielsen’s data and the inadequacy of its methodology, its ratings have been largely unchallenged as the measure of TV audiences and thus, as the measure of advertising reach for the medium. 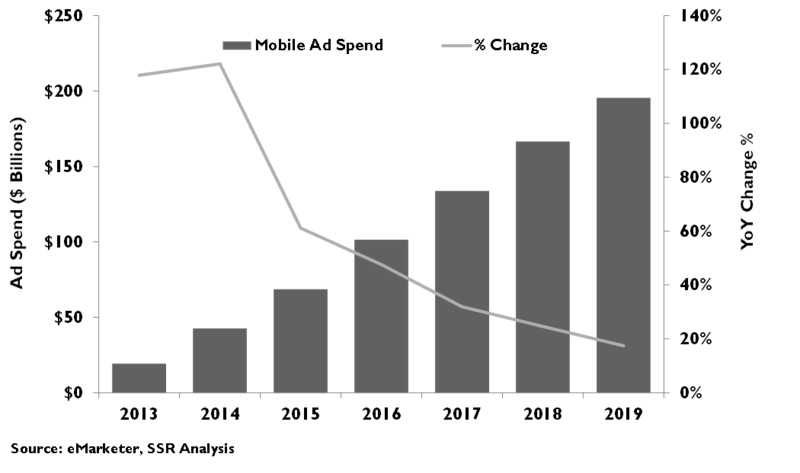 In the emerging cloud era, where internet video purveyors can target advertising at specific individuals, determine whether or not each individual actually watches the ad, and then track each individual’s online behavior after the ad impression, the imprecision and bias of the Nielsen ratings are a potential millstone around the necks of TV networks looking to drive the premium prices paid for their ads even higher. At the very least, they have obfuscated the deterioration of the TV audience and the consequent rise of on-demand streaming, leaving network executives too confident for too long. 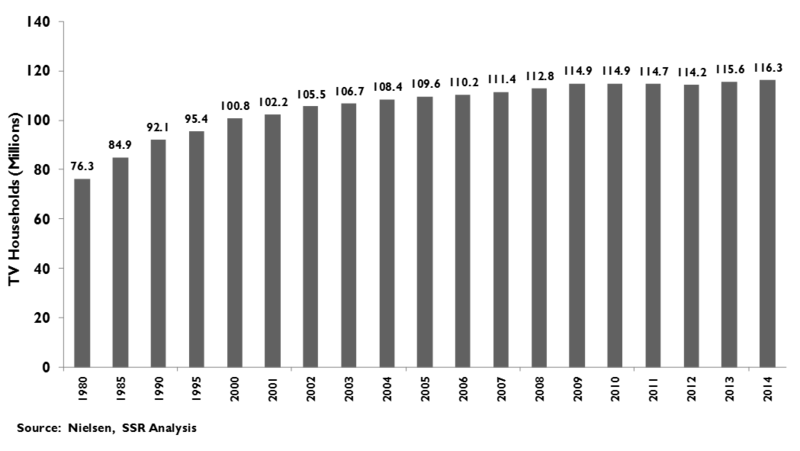 After decades of growth, the number of pay TV subscriptions – cable, satellite and telco – have been shrinking for two years. These two years are part of a much longer trend of deceleration that suggests that, rather than an aberration, we have passed an inflection point and that future declines may accelerate. 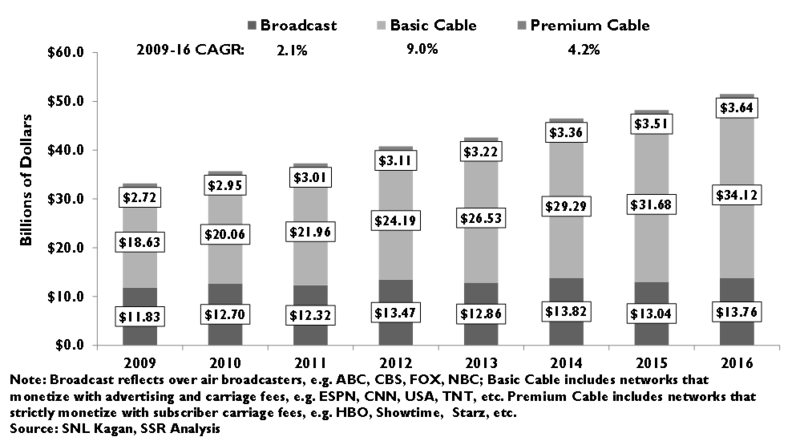 Over the past ten years, the all-in price of the video portion of a cable subscription has risen at a 7.1% CAGR to $123/month, most of that passed back to the media leaders in the form of rising fees (Exhibits 6-9). With the emergence of attractive streaming entertainment alternatives at much lower prices increasingly available to the living room TV, cord cutting is a viable alternative of which households are increasing taking advantage. This phenomenon will sap the fee revenue received by networks – per sub payments will decline and MSOs will be more inclined to push back on demands for higher fees given their inability to pass them on to consumers without consequence. It will also affect ad revenues, as fewer pay TV subscribers mean fewer viewers. Ad Buyers are Mad as Hell, and They’re Not Gonna Take it Anymore …. Advertisers are pushing back hard against the networks’ machinations. An estimated 35% of TV advertising is considered time sensitive – think opening week movie ads or automobile sales promotions – and impressions a week later for these spots are considered nearly worthless. Furthermore, more than half of DVR viewers skip through the commercials, while the remainder may be failing to do so because of distractions. GroupM, the powerful ad buying arm of the huge WPP agency, has reportedly signed deals for C7, but at significant CPM discounts. Broadcast laggard Fox also pushed for more C7 deals at the 2015 Upfronts. If the networks can engineer an industry wide transition to the new metric, it will come at the cost of much lower CPMs for time shifted impressions, making the industry revenue impact well below the estimated 3% bump in total viewership. Moreover, it is almost certainly a one-time bump – it’s hard to imagine advertisers agreeing to a C10 measure for primary ad buys. 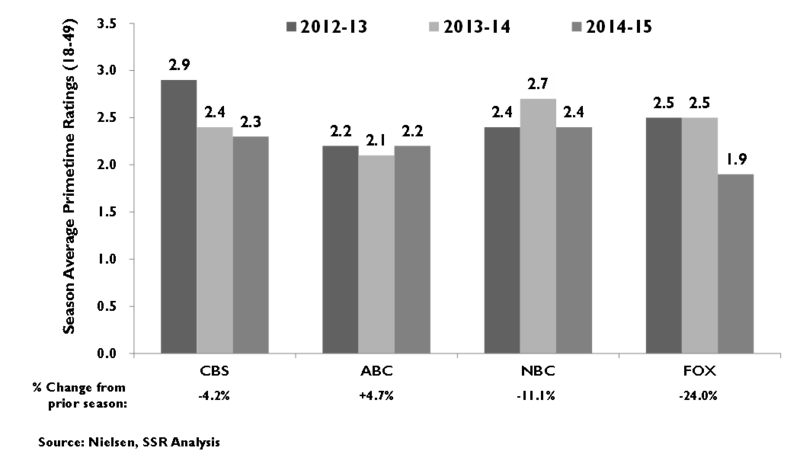 In the meantime, Networks have responded to lower ratings by adding additional commercial time to each hour of content, with the broadcast nets raising their ad load from 13 minutes and 25 seconds per hour in 2009 to 14:15 today (Exhibit 10-11). With almost 25% of every hour now devoted to ads, many viewers may be finding their tolerance tested. Hence the air of puffery and bravado. If audiences are in inexorable decline, the advertising load is near a practical threshold and a shift to C7 will add little IF it can be accomplished, CPM is the only lever, and both networks and advertisers know it. Given ad skipping on DVRs, mobile device multitasking during commercial breaks, and the inability of Nielsen’s metrics to distinguish between active from ambient viewing, buyers have ample reason to question the continued efficacy of TV advertising. Advertiser commitments during the 2015-16 season upfronts were down 5-8% overall, according to Ad Age, with contentious agency negotiations dragging out until late July and early Augusts, weeks later than usual. NBC was quick to trumpet that its upfront dollar volume was up 2% to just under $6B, but included a 50% hike for on-demand digital ads and commitments for the summer Olympics and expanded NFL broadcasts. Given this, it is very likely that non-sports linear broadcasts experienced a decline. Ratings leader CBS’ CEO Les Moonves said that the company was able wrangle a mid-single digit CPM increase, but nonetheless saw lower commitment volumes despite taking orders for its February Super Bowl broadcast. Disney hasn’t commented on its commitments, noting only a CPM increase – its tepid forward guidance suggests that volumes are likely down. Variety reports that ratings laggard Fox made fewer deals on flat CPMs, coming close to selling the same 75-80% of inventory as last year. 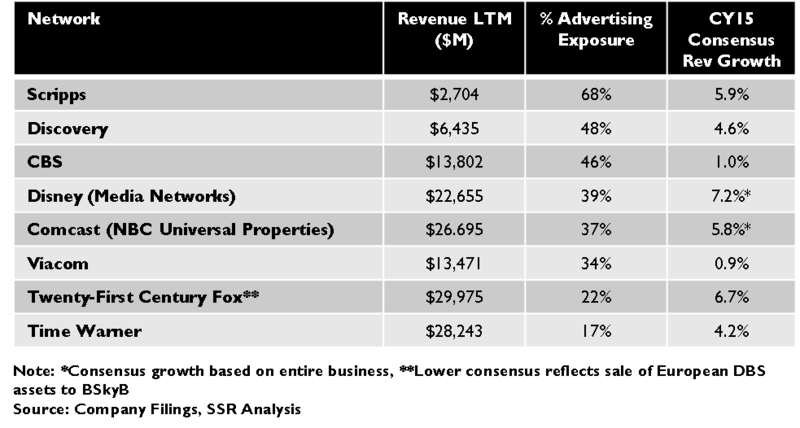 Most cable networks have yet to provide details of their upfronts deals, but if Ad Age’s estimates are correct, they likely took a bigger hit than the broadcast nets. Media companies are putting a brave face on all of this. Les Moonves tried to wave away CBS’s weak upfront commitments by suggesting that advertisers were merely following a trend of pushing ad buying decisions closer to the air date, but the generally weak scatter market, where ads are bought outside of the upfronts process, and the recent disappointing financial results, point to the big risks inherent in that trend. TV advertising was down this year (Exhibit 12). 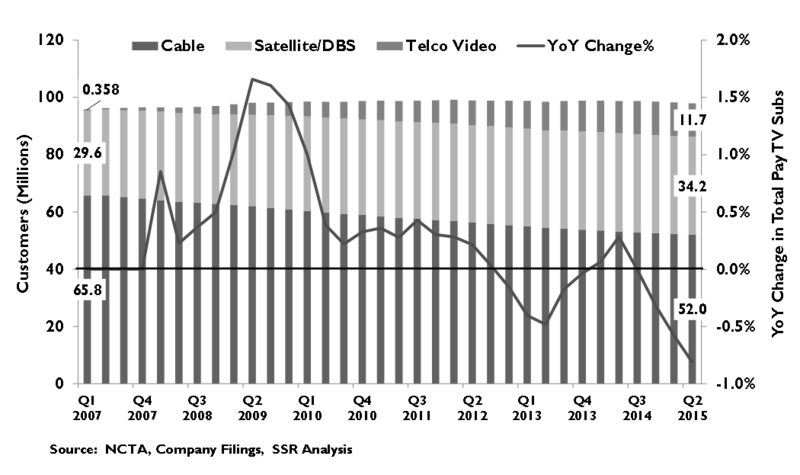 We believe that forecasts of a big bounce back in 2016 on the back of Olympics and elections may be optimistic. 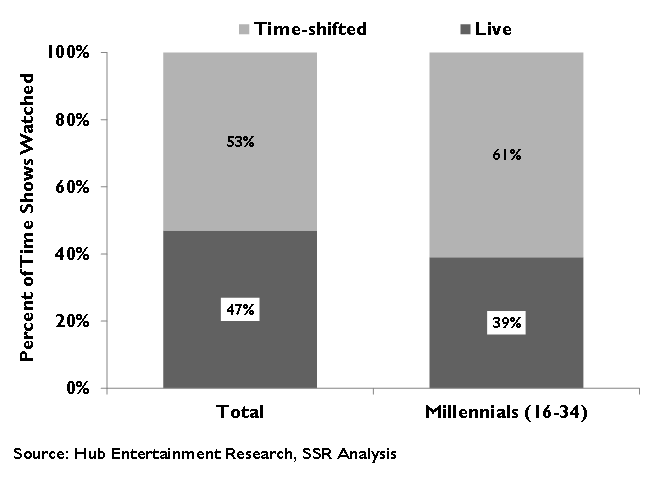 US consumers are watching less TV, mostly because they are spending more time on line. Netflix, by far the largest online streaming video service for studio-produced programming, has grown from less than 20M US subscriber households in 2010 to more than 42M today, with viewing hours increasing at a 40% annual rate. Amazon, whose Prime Video service is available at no extra charge to its estimated 40M US Prime members, does not reveal any details about the reception to its service but has been active in green lighting original programming to add to its service. 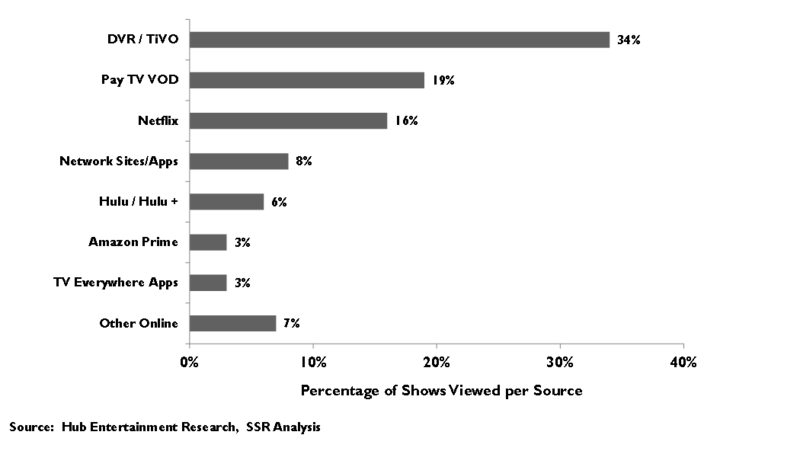 According to HUB Research, roughly a quarter of all video viewing on US television sets is streamed from the Internet (Exhibit 13). This is a double whammy for the TV nets. Not only is their audience migrating to Netflix, and to a lesser extent Amazon Prime Video and others, but these rivals are competing for programming as well. It has been an industry assertion that “content is king” but the big media network operators don’t really “create” the content, they buy it. As programs run the arc of popularity and as talent chooses to move on to other projects, networks must constantly shop for replacements. 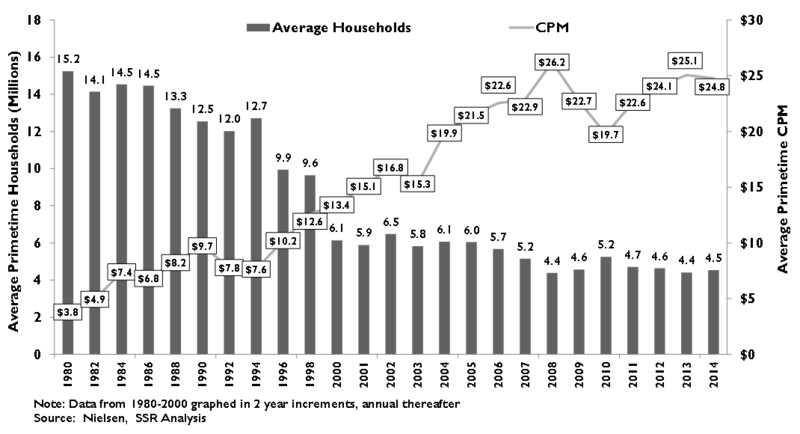 The rise of cable networks, like HBO and AMC, has already driven content costs up for all TV networks. The growth of Netflix is worse. Netflix is not bound by a linear schedule with fixed time slots – for 2016, it will be running 36 original series, all available at any time to any subscriber, up more than 60% YoY. Not only does it have unlimited “time slots”, a rapidly expanding subscriber base and growing engagement, but it also leverages deep knowledge of its subscribers’ preferences gained from analyzing every viewing decision that they have made. This is a formidable advantage in buying programming, allowing them to satisfy the needs of the passionate niche viewer as well as the evinced tastes of the broader public. The implication is a virtuous cycle for Netflix, as more and better programming draws more users who watch more often, allowing Netflix to buy more and better original programming. On the flip side, TV networks suffering from smaller audiences, lower fees and tighter ad sales, are less able to buy the best programming, and the cycle turns in the opposite direction. Live sports contracts, the supposed ace in the hole for linear networks, must be renewed when they expire and nowhere has the inflation in the value of programming been more evident. 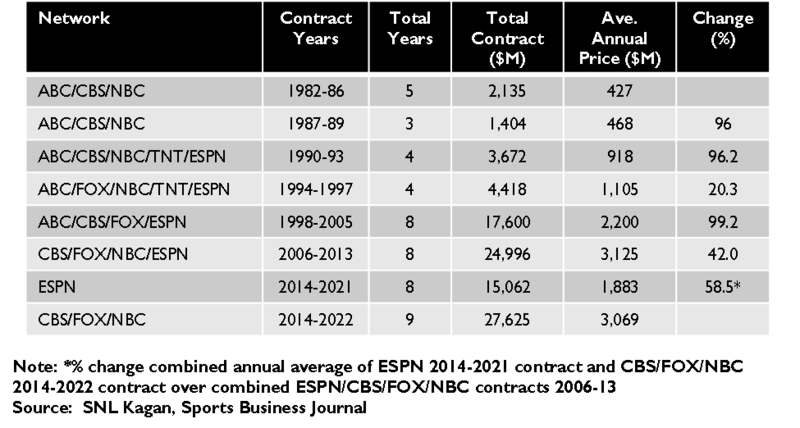 Fees for NFL football, the bellwether for sports rights, have more than trebled over the past decade to nearly $7B per year in a handful of contracts with linear networks that run through the 2021 season (Exhibit 14). 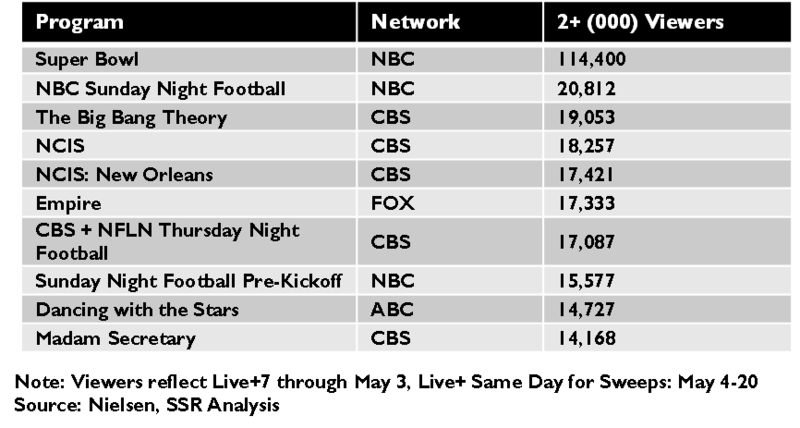 The NFL is immensely popular – 4 out of the 10 most popular broadcasts for the 2014-15 TV season were professional football games, including the Super Bowl, which was the most watched program, seen by 114.4M viewers (Exhibit 15). When these contracts have run their course, the NFL will expect another raise and will have a viable option to take at least some of its content on-line under its own brand, a move already taken successfully by Major League Baseball. In the face of their deteriorating fundamentals and the enormous threat of on-line video, TV networks are beginning to loosen their fierce loyalty to the cable bundle and license their linear feeds to companies that are trying to replicate the cable bundle on line (Exhibit 16). Dish Network’s SlingTV was first, bundling 20 channels, including ESPN and CNN, for $20/month. Designed to complement over the air broadcast, SlingTV does not offer any of the broadcast networks. It also does not allow DVR functionality, a significant drawback, given strong consumer preference for time shifted viewing. Just after SlingTV, Sony introduced Vue, a 50 channel service, including NBC, CBS and Fox but no ABC or ESPN, available via a Playstation console for $50/month. Like Dish, Sony was not permitted to provide DVR functionality. Finally, rumor has it that Apple is in negotiations with the major media companies and their local affiliate stations to provide its own OTT service including linear streams of the network affiliate stations in major markets. While details of the planned service remain secret, it would seem unlikely that Apple would gain local affiliate streams or DVR functionality without significantly higher fees, which would almost certainly be passed along to subscribers. As such, the Apple OTT service could be quite pricey indeed. All of this, when the viewer preference for time shifted content is growing unequivocal. HUB Entertainment Research’s study of TV viewing habits revealed that 53% of US video viewing was time shifted via a DVR, PayTV on-demand, or an on-line streaming service. The shift was even more apparent amongst millennials, who viewed time-shifted content 50% more than they watched live TV (Exhibit 17). 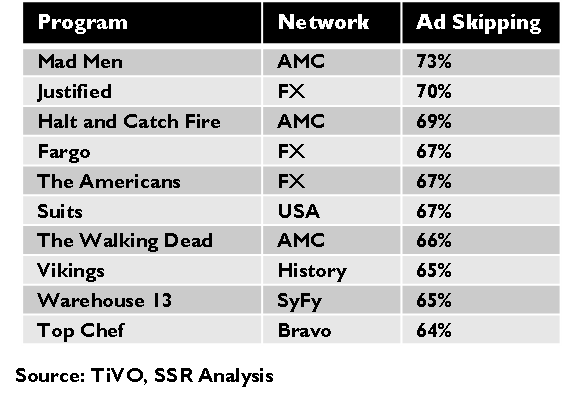 The reasons for preferring time-shifted content were largely about convenience rather than pure ad skipping, although other studies have suggested that as many as 72% of all ads are skipped during DVR viewing (Exhibit 18). Netflix and its trove of content can be had with an $8.99 monthly subscription. Amazon Prime Video is included in a $90/year Prime subscription, for which the main draw is the free 2-day shipping on e-commerce purchases (Exhibit 19). Advertising driven YouTube requires no subscription fee at all, and is attracting more than 10B monthly viewing hours globally across a spectrum of devices for its massive selection of programming. In this world, OTT subscriptions to linear TV without DVR capability will be a tough, tough sell. Perhaps Apple will cut an aggressive deal that enables time-shifting and offers a wider range of content at an attractive price, but the stance of the media industry would seem to make that very unlikely at this time. Can Netflix Be Stopped? No. We believe that Netflix’s daily audience is greater than the largest TV network. To recap, Netflix announced that its total streaming hours had passed the 10B mark for 1Q15, and given sequential subscriber growth and an overall growing engagement trend, it is likely that the total for 2Q15 was materially higher. 65% of Netflix subscribers are in the US, and given the longer experience of these subscribers, the depth of the English language catalog and the substantially higher overall TV viewing of Americans, we believe that US subs are likely to watch more Netflix than their international counterparts. Based on the likely sequential growth in 2Q and the assumed greater propensity to watch, we believe that US subscribers watched at least 7.5B hours of Netflix during 2Q15. Dividing by 91 days yields 82.4M hours streamed per day. We note that Netflix reports hours per household, while Nielsen estimates the number of individual people watching each program. Assuming that there are 1.5 viewers per Netflix stream, brings the hours per day to roughly 124M. By comparison, CBS, the most popular linear network reached 34M viewers per evening during primetime for the 2014-15 season according to Nielsen, and while this estimate does not include viewing during other parts of the day, it seems likely that total CBS viewing is well behind Netflix. 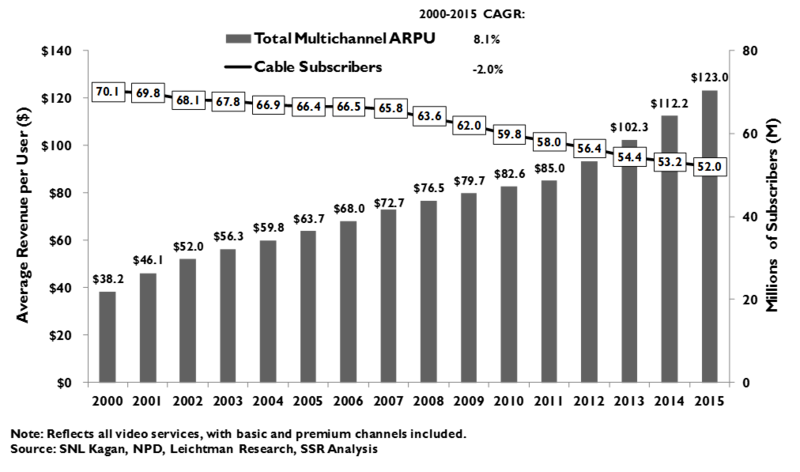 Moreover, Netflix’s viewing hours are growing – up 40% YoY during the most recent quarter (Exhibit 20). Of course, Netflix doesn’t get paid on viewing hours, it gets paid on subscription growth. Total subs were up 32% YoY in 2Q15, to nearly 66M, with revenue up 23% against the FX headwinds (Exhibit 21). Netflix is using its strong revenue base to invest in programming. It plans 36 original series for 2016, nearly 75% more than rival HBO, and up from just 10 in 2014. Netflix is also delivering quality. Those 10 series from a year ago garnered 34 Emmy nominations, still a fair step behind HBO’s 126, but remarkable, given Netflix’s short tenure as a source original programming (Exhibit 22). While Netflix undoubtedly enjoys the attention that comes with Emmy nominations, it is more interested in viewer satisfaction than critical acclaim. Here, Netflix has an enormous advantage over its rivals. Because it is all on-demand and because it has painstakingly developed a system for codifying its subscribers’ tastes and preferences, Netflix has been able to use its data to accurately predict the popularity of particular programming with its viewers. This data driven approach gives it substantial advantage in negotiating for new content, quickly greenlighting high-potential projects while eschewing programs less likely to gain popularity. It is also able to buy niche programming that may appeal to a small but passionate subsector of its subscribers, for example the horror series Hemlock Grove, where a linear network would have difficulty dedicating a “time slot” to content without more general appeal. With its superior selection of content, its well-designed user interface, its data informed programming recommendations, affordable price point, and strong brand recognition, Netflix is well positioned to expand its dominance of on-demand studio produced video content streaming. We expect subscriber growth to continue apace to top 100M by the end of the decade, with commensurate growth in revenues. In addition, we believe that there are several future monetization options available to Netflix. First, Netflix could introduce an advertising supported tier, lowering the entry price and driving new subscription growth while offering premium advertising inventory to a market with limited digital video ad options. We believe that it is likely that a low-priced ad-supported service could prove MORE lucrative than the current subscription model. Netflix could also introduce a premium tier – perhaps including live event streaming or early window movie releases. While CEO Reed Hastings has repeatedly denied interest either ads or a premium tier, we note that he has changed his mind several times in the past on topics of strategic importance to the company. Finally, Netflix could raise prices again. Last year’s $1/month hike proved a non-event on the subscriber front, and given the ever greater value that the company is delivering with its original content and the high prices charged by would-be competitors, it could certainly take its fees higher in the future without too much risk. Google’s YouTube is a less directly analogous competitor to linear TV, with its short-form, independently produced, mobile friendly video content. Still, the viewership statistics are mind boggling. 10 billion hours of watch time per month on a global basis – 3x the time spent on Netflix – up 60% YoY in 2Q15 for the fastest growth in 2 years. The service reaches roughly 185M monthly unique visitors in the US. Half of YouTube views and watch time stem from mobile platforms, where advertising revenue is up more than 100% YoY (Exhibit 23-24). This massive audience comes for the massive selection of largely exclusive content. Every minute of every day, 400 hours of new content is uploaded to the service, the pace up more than 100 hours in just 7 months. There are 2.5M exclusive YouTube creator channels, of which 1,268 have more than 1M subscribers. 8 of the 10 most popular celebrities with US teens are YouTube stars. This is the most formidable challenge to TV advertising in the market. Google is one of the two most sophisticated digital ad selling operations and has recently shifted policy to apply profile information from its other businesses, including search, to better target YouTube ads. Total YouTube revenues are a closely guarded secret, but outside estimates put 2015 sales within the wide range of $4-6 billion, likely growing at a better than 25% annual clip. Having pioneered this content creator friendly medium, YouTube dominates it. Challenges, most notably from the music industry owned Vevo, have failed to gain enough independent traction to break away from it – it is very, very difficult to replicate a service with reach numbers exceeding a billion people, engagement that tops 10B hours a month, and Google’s powerful digital ad sales platform. While Google may take 55% of the ad revenues it sells, 45% of a big number is considerably better than a 100% cut of something much, much smaller. Into this whirlwind flies Facebook. Mark Zuckerberg and company is launching its own video hosting service in hopes of siphoning off some of YouTube’s growth. While Facebook enters with its enviable reach to nearly 1.5B global registered users, a top notch platform from which to serve video, and best-in-class technical tools for targeting and tracking advertising, it starts out far, far behind YouTube on many aspects of the on-demand video business. First, Facebook lacks YouTube’s massive searchable archive of content – it may be good at breaking a viral video but it is bad for users looking to find particular content and for talent looking to build a regular following around a body of work. 50% of Facebook video views occur on the first day of release, compared to less than 30% on YouTube. Second, YouTube has strong relationships with 2.5M exclusive creators and their hundreds of millions of fans. Replicating that ecosystem will be near to impossible. Third, Facebook’s progress on video is not nearly as great as management suggests. According to YouTube CEO Susan Wojcicki, 72% of Facebook’s video views are ripped from other sources by users and reposted to Facebook – thus not eligible for ads. Furthermore, Facebook policy counts video views after 3 seconds and auto starts video as the user scrolls through it on a newsfeed. Overall, the Facebook Newsfeed is a good place to spread viral videos and to place native video ads, but a poor place to nurture a creative franchise or monetize a catalog of programming. Perhaps, Facebook will break video out of its omnibus newsfeed, like it has for messaging and how it has maintained Instagram. This could provide a more functional alternative to YouTube, but would highlight just how far behind it really is. The squeeze on linear TV – shrinking audiences, falling ad sales, push back on fees, and rising content costs – will be universal and irreversible (Exhibit 25). Even Disney, long thought to be resistant, if not immune, from these pressures because of its focus on live sports, owned up to its struggles during its most recent conference call with investors. While its studio continues to deftly exploit its massive tentpole movie franchises, feeding its consumer products and theme parks in the process, ESPN has begun to show signs of erosion. CBS, still filled with bravado, also revealed the deterioration that has begun in its ad sales for linear TV. These are the best operators in media. Fox is enjoying a bump in fee revenues after some new contracts, but the rest of the story is the same. Viacom is getting the worst of it, as its core youth demographic has been the first to drop linear TV. Discovery, Scripps and AMC are in the same boat. Comcast’s cable business overshadows its NBC/Universal subsidiary, but the long term implications for cable are no rosier than for the networks even if they will take longer to play out. On the other side of the ledger, we believe that Netflix has a lot more runway. Subscriptions will keep rising as more households upgrade to TV equipment that connects to the internet and as Netflix grows in international markets. Netflix can add new products to its core service – premium tiers, pay-per-view events, an ad supported alternative, etc. It can also raise prices – it’s done it before and would-be rivals like HBO Go are leaving a lot of room with their own high priced offerings. Projecting 20-25% annual growth through the end of the decade with leverage to the bottom line suggests 30-50% further upside from here. Google is also a clear winner. YouTube is still small relative to search, and undoubtedly far less profitable, but the potential for growth is considerable. YouTube’s mobile revenues are up 100% YoY – that’s faster than Facebook or Twitter – and mobile is already 50% of the service’s 10B monthly hours of watch time. Like all cloud-based businesses, YouTube likely enjoys considerable economies of scale, and as its monetization grows, there will be substantial leverage to the bottom line. Look for Google to begin splitting out results for YouTube with the next year or two. Amazon and Facebook will certainly be players in the streaming revolution. For Amazon, the incremental benefit of Prime Video as a part of Amazon Prime is very hard to quantify, but it is likely modest compared to free shipping in attracting consumers to the membership program. For Facebook, we expect it to sell a lot of video ads, but for the primary vehicle to be auto-roll native ads parsed into user newsfeeds. We do not expect it to threaten YouTube’s dominant position in independently produced short form video. Finally, we are intrigued with Twitter’s fledgling Periscope app, which is pioneering ad hoc personal video streams. The early response is very encouraging and fits well with the core Twitter service.